OUR MISSION: to offer opportunities for a life of dignity and hope to very low income seniors in Multnomah County by solving housing and transportation needs. Our staff works with very low and extremely low-income seniors in Multnomah County to help them keep and find housing they can afford. Thanks to the generosity of thousands of individuals and businesses, and through partnerships with area funders, we have provided housing placement, transportation and support to more than 40,000 older adults over the last 50 years. We believe housing is a human right and that every older adult deserves safe, decent housing they can afford. All low-income seniors have the opportunity to live in safe and affordable long-term housing. At NWPP, our values have a purpose: they guide our choices in the decisions we make every day. Dignity – We respect the inherent value and worth of each person and treat everyone with genuine dignity. Compassion – We truly care about what we do and are committed to serving with empathy, caring and support. Equity – We acknowledge that our current social, economic, and political systems are unfair. We marshal our resources to advance equitable opportunities and outcomes for all. Kindness We lead and act from the heart and strive to create a culture of kindness, gentleness, caring, and trustworthiness. Advocacy – We raise our voice and the voices of those we serve for legislative and social policy issues that support decent, safe, affordable housing for low-income seniors. Respect – We treat each other, our clients, partners and supporters with mutual respect and sensitivity, recognizing the importance of diversity. We respect all individuals and value their contributions. Effectiveness – We remain true to our mission and work hard to provide exceptional service to our constituents and maximize the support of our donors. Responsiveness we strive to be accessible, flexible, transparent, and to demonstrate a sense of urgency in our resolve and decision-making. Fiscal responsibility – Staff, board and volunteers all have a duty to ensure that the money the organization raises is spent wisely on programs directly related to the agency’s mission. Integrity – We carry out our work with the greatest responsibility and accountability. Northwest Pilot Project staff members and Board recognize Oregon’s history of discrimination and injustice, and the disparities in access to resources and opportunities that communities of color face today. 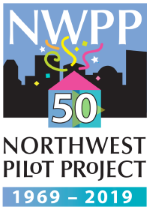 NWPP is committed to evaluating and increasing the access, services and success rate in our programs for people of color. In our fiscal year 2017-18, 42% of the households we served in our Housing Program included a person of color. We continue to examine our program outcomes through an equity lens and are working on compiling and analyzing consumer feedback on our program, including analysis by race and ethnicity.